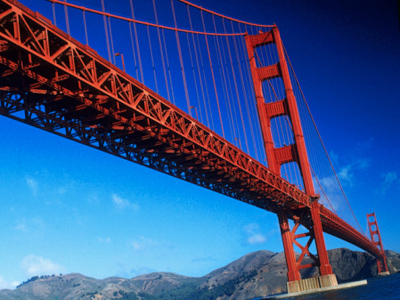 Only two percent of those who attempt to jump off the Golden Gate Bridge in San Francisco survive. A 17-year old high school student is the latest to do so. A California teen jumped off the Golden Gate Bridge on a school field trip and survived the 220ft (67m) fall into San Francisco Bay. A statement by the school said the student suffered no major injuries, merely bruising. "It's a miracle in itself," California highway patrol officer Chris Rardin said. "The majority of folks do not survive this type of fall." The school said they do not believe the teen was trying to commit suicide, but instead may have made the jump on a dare by fellow classmates. Around 98 percent of those who jump off the bridge die, most of the deaths are ruled to be suicides. Transportation officials are currently in the process of finding a way to prevent such deaths, by creating and installing a massive steel net.